When connecting your Walkman to PC via USB, the following issues may occur. your Walkman is not recognised by the PC. your Walkman does not charge. As a remedy, start by making sure the Walkman is firmly connected with the USB cradle and USB port. If afterwards the PC is still not recognized, try to clean the Walkman terminal, as dirt might cause some connectivity problems. Finally, you can try resetting your Walkman to the factory default settings. If none of these steps resolve the issue, your Walkman will unfortunately might need a repair. 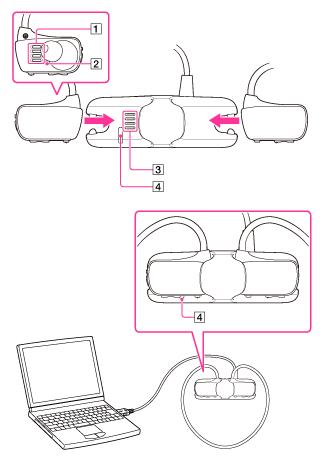 Attach the Walkman to the supplied USB cradle, making sure the terminals of the Walkman (1) and the supplied USB cradle (3) are in contact with each other. 1. Check whether the operating lamp (4) on the cradle lights up in red. If yes, charging has started. If not, the terminals may still be dirty, or the Walkman might need a repair. 2. Check whether your computer recognizes the Walkman. If not, the Walkman might not be properly attached to the USB cradle, or there might be an issue with the USB cable or the computer’s USB connectivity. Please try connecting it to another USB port and/or computer. 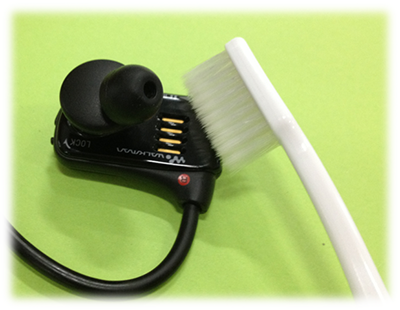 Clean them using a soft bristle toothbrush (moisturized by water). Brush the terminals gently, to avoid scratches on the cabinet. WARNING: There is a risk of hardware damage. Do not dry the Walkman using hot air from a hair dryer. WARNING: There is a risk of hardware damage. The cradle is not waterproof. Please do not wet the cradle. After brushing, rinse the terminals off with fresh water. Wipe away the water on the Walkman using a soft cloth or cotton bud, and then leave the Walkman in a well-ventilated shady place to dry. If the terminals on the USB cradle are dirty, try cleaning them with a dry soft cloth or similar. NOTE: No data will be deleted by resetting your Walkman. If the problem persists after clearing these 3 steps, the Walkman might need a repair.